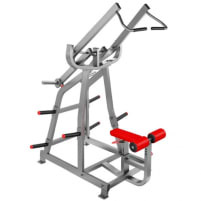 Training on a lat pulldown strains the lats or large back muscles including the trapezius muscle, deltoid muscle, rhomboid major muscle, infraspinatus muscle and biceps. 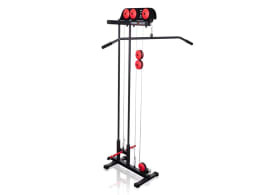 As the lat pulldown is a basic strength training machine, it is suitable for beginners. 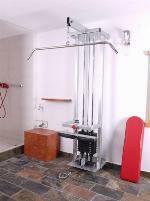 The lat is pulled top down and the weight can be individually adjusted. 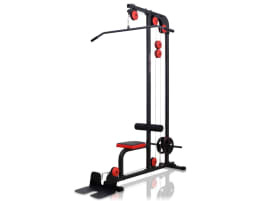 How does the training on a lat pulldown work? The athlete sits on the padding in the direction of the lat tower and leans the upper body with lifted breastbone slightly backwards. The bar is held shoulder-width with palms to the front. The main part of the exercise is pulling the bar to the upper chest. The shoulder plates should come together as close as possible and the back should be as straight as possible during the exercise. Pulling the elbows backwards while doing the downwards movement will increase tension of the back muscles to the maximum. It is important to pull down the lat bar vertically, controlled and without momentum. The training can be done with different grip positions. Like before every other training, a good warming up before starting is essential to avoid injuries. 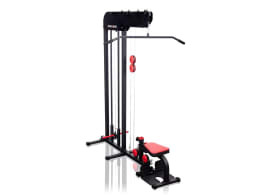 Furthermore you should get advised by an expert who can show you effective methods for the training with the lat pulldown and tell you a suitable weight customized to your body and strength level. For beginners it is very important to use light weights and increase the load slowly. 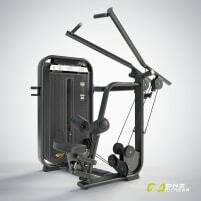 You want to strengthen your back muscles, but don’t have enough time to go to a gym for training? 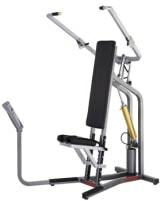 Then it is a good alternative to buy a new or used lat pulldown for your home. However, before using the lat pulldown you should get advised by an expert on body posture, weight and number of exercises. 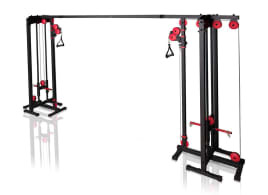 If you want to sell a new or used lat pulldown, you can insert the ad with a detailed description of your training machine. Pictures of your used or new article will even increase your chances of sale. 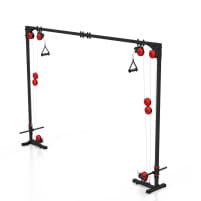 You can also find useful training tips for lat pulldowns in the fitnessmarkt.com magazine!